L-R: Judith Green, Director of Marketing and Recruitment; Ullas Kumar; Regina Dias; and Alan Hardie, Head of University of Sunderland in London. 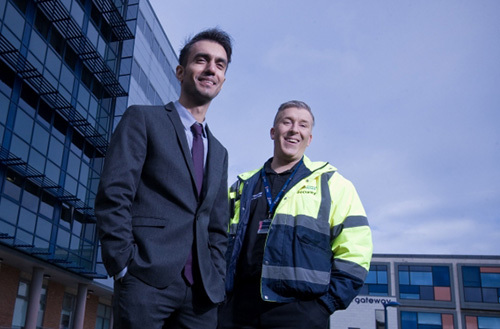 Syed Azeem at the Sunderland City Campus. University of Sunderland in London students visited Sunderland recently to share their success and meet some of the staff and students who have helped them in the journey. 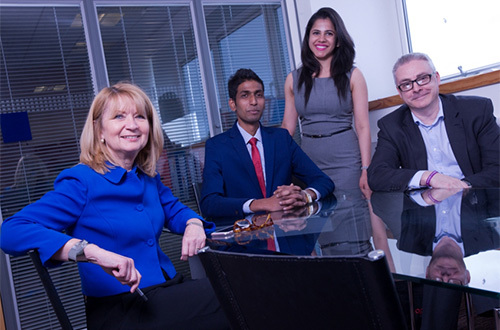 Regina Dias and Ullas Kumar (pictured on the left with Judith Green, Director of Marketing and Recruitment and Alan Hardie, Head of University of Sunderland in London) have been creating waves during their internships in Marketing and Recruitment at the University of Sunderland in London. Following completion of their MBA in Marketing both have been offered three-month internships and have project managed areas of social media, podcasting and a new University of Sunderland in London blog. Syed Azeem, another MBA graduate, has also recently completed an internship with the University of Sunderland in London in Events Management. During his time Syed engaged students and staff in a number of extracurricular activities such as cricket and table tennis tournaments, took students on trips to Canvey Island and reinvigorated the thriving student societies in London (in Business, Travel and Tourism and Bright Futures and the newly created Creative and Nursing societies) by assisting in society elections and training. Syed has been involved with the Business Enterprise Certificate in London which gives students the chance to work with business leaders to develop workable business plans and this has paid off as he has had added success working with the Enterprise Place to develop his business aspirations and will now be endorsed by the University as tier one graduate entrepreneur to set up his own security company. Ruth Wilson, Student Relations and Compliance Manager at University of Sunderland in London - who line managed all three interns - said: "It has been fantastic to see Ullas, Syed and Regina do so well in their internships, the combination of academic excellence that their MBA provided them, as well as their technical skills and enthusiasm for the University has meant each of their projects has had a unique mix of personal and professional. I am thrilled to see them move on from University with first-hand experience to add to their employability portfolio." Representatives from University of Sunderland in London societies – Nursing, Tourism, Bright Futures and Business – also visited the North East recently, where they took part in events with their fellow society members and attended the sport and society ball at the Stadium of Light.